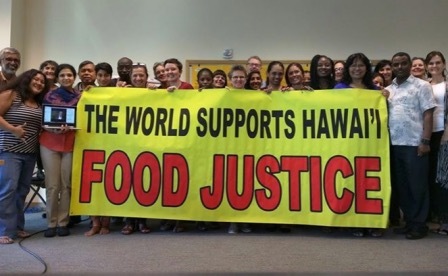 We, as members of the international community from Asia and the Pacific, Africa, Latin America, Europe and the continental United States, convened by Pesticide Action Network, are gathered in Hawaiʻi in January 2016 to stand in solidarity with the movements in Hawaiʻi working to free the islands from the toxic influence of pesticide/genetic engineering (GE) corporations. Hawaiʻi is ground zero for the development, experimental use and production of pesticide–promoting genetically engineered crops. 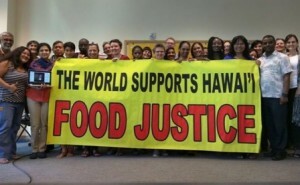 Five chemical corporations –Syngenta, Monsanto, Dow, DuPont/Pioneer and BASF – facilitated by the government of Hawai’i – occupy tens of thousands of acres of the most fertile agricultural land, including public land which should rightfully be in the hands of the Kānaka Maoli (Hawaiian nationals). According to state law, water in Hawaiʻi is part of the public trust and cannot be privatized. Yet these corporations divert and contaminate this most precious and important common resource, leaving quality agricultural lands and key habitats without a source of water. These land and water grabs are resulting in severe damage to the ecology of Hawaiʻi, and place the burden of health and environmental costs onto local communities, with no accountability for – or compensation from – the agrochemical industry. These corporations are holding Hawaiʻi’s people hostage. Successful democratic processes on seven of the eight Hawaiian islands resulted in policies requiring disclosure of pesticide use, a moratorium on the use of genetically modified organisms (GMOs) until health and environmental effects are evaluated, and pesticide-free buffer zones around sensitive sites like schools and hospitals. Now the chemical corporations have sued all of the counties that passed such policies, stopping their implementation – for the time being. We can look at Hawaiʻi to see the nature of these companies and their products: parts of the archipelago are sprayed as much as 250 days per year, or seven out of ten days year round. Many local doctors and nurses have submitted official testimony stating concern that they may be witnessing higher rates of asthma, hormonal diseases, rare cancers, miscarriages, birth defects, and skin disorders in communities living adjacent to experimental fields. Companies have fought even basic notification rules so that families and schools are unable to protect their children from regular chemical exposure. Workers and their families are most impacted. Just two days ago, ten Syngenta agricultural workers were poisoned by Dow’s product chlorpyrifos and sent to the hospital on Kaua’i. Agricultural workers around the world face similar dangers of acute poisonings and chronic long-term exposure. Similar to other plantations around the world, many of those working on agrochemical operations in Hawaiʻi are migrants that have themselves been directly displaced by corporate agribusiness. Let’s be clear: none of the crops these corporations are growing feed people in Hawaiʻi; Hawaiʻi imports more than 90 percent of its food. The seeds grown in Hawaiʻi feed primarily factory farms and fuel cars. They are the foundation of the fossil-fuel and resource intensive, polluting, and climate-devastating industrial agricultural system. As has been acknowledged by the most prestigious international bodies, feeding the world sustainably requires a dramatic transformation away from this system. That these corporations will act so boldly and rashly in the endangered species capitol of the world portends great threat to the rest of our global ecology and humanity. The fight to end the overuse of chemical pesticides and their increasing promotion through genetic engineering begins in Hawaiʻi, and extends around the world. In Africa, these technologies are being pushed by the same corporations that are engineering hunger and working to control and patent staple food crops. In Asia, the debt engendered by these chemical corporations and their expensive, patented technologies, has driven rural crises, including an increase in farmer suicides. In the last ten years we have seen a heightened and very aggressive attempt to transform the landscape of ecologically sound food-producing land to genetically modified crops. Brazil, Argentina and Paraguay have become the “transgenic soybean republic,” with devastating health impacts from the associated rise of pesticide use. In Mexico, birthplace of maize, there is strong resistance to genetic theft and GMO maize. In the continental United States – where around half of the farmland is planted GE crops — farmers are facing fewer market options, higher input costs, superweeds, and damage to surrounding crops and ecosystems, while too many rural families face cancer, diabetes, and Parkinson’s disease. We link our struggles to the struggles of the people of Hawaiʻi. We pledge our commitment to stand together and organize our communities to protect our homes, our children, and our shared planet. The agrochemical industry is global and so is our collective fight. Advancing sustainable agriculture as a holistic, scientific approach and a movement for social transformation that upholds local knowledge and respects indigenous cultures, integrates participatory research, empowerment of women, farmer control over land, water, seeds and forests, protection of workers’ rights and of rural communities, appropriate technology, bio-diversity conservation, access to and equitable distribution of food, equitable sharing of benefits and food self-sufficiency respecting ecological integrity. Contributing actively to the elimination of harmful pesticides and other agrochemicals and the generation, innovation and promotion of ecological alternatives to pesticide use, especially organic and ecological agriculture with biological, agricultural and cultural diversity as the basis for sustainable communities. Eliminating the use of harmful pesticides in buildings, transportation, household, public health and other non-agricultural pest control areas. Fighting for local, national and international agreements to restrict, reduce and eliminate pesticide dependence and to phase out and ban pesticides that cause acute and chronic effects, including endocrine disruption and cancer. Ensuring food for all, including national policies that promote and ensure the right to food in order to achieve the improvement of human and environmental health. And establishing Food Sovereignty as the inalienable right of peoples, communities, and countries to define, decide and implement their own agricultural, labour, fishing, food and land policies which are ecologically, socially, economically and culturally appropriate to their unique circumstances. Creating awareness of the dangers of genetically modified organisms (GMOs) and campaigning to stop the development and use of GMOs in food, agriculture, pharmaceutical crops and animals, forestry and prevent terminator seeds. We demand the implementation of the precautionary principle to prevent the spread of the use of GMOs. Withdrawal of subsidies for environmentally-unsound agricultural technologies and end all aid by international development agencies for hazardous pesticides, GMOs and industrial agriculture promotion. Strengthening people’s movements and empowering women, peasants, poor farmers, fisherfolk, dalits, landless farmworkers, Indigenous people, migrant workers and bonded laborers to participate fully in asserting and promoting their rights, decision making in their societies and access to land, resources and knowledge. Strengthening and integrating gender issues in all agriculture programmes from planning to implementation and evaluation. Empowering communities to monitor and resist the impact of trade policies, technologies, and industries that affect their health and livelihoods. Launching and supporting campaigns against corporate globalization and the international institutions and instruments that are destroying people’s production and promoting corporate and industrial agriculture. Achieving the public release of information by all companies, governments and institutions on production, use and trade of pesticides and GMOs. Demand full accountability and liability for injustices by corporations and governments and full compensation for damages for persons, communities and countries. This entry was posted in Blog and tagged Agroecology, Food Justice, Genetic Engineering, GMOs, Monsanto, Pesticides. Bookmark the permalink. ← And on Earth, Peace, Good Will Toward Men?